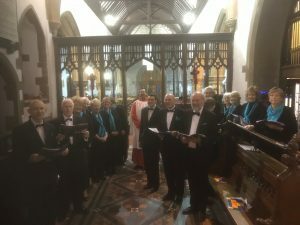 On Sunday 25 November 2018 a small ensemble from the Norwich Singers travelled to Balderton near Newark in Nottinghamshire to sing at an evening service at St Giles Church. The service took the form of songs, readings and meditations to assist in preparing for Christmas. Both choir and congregation found it to be a lovely and moving experience. We were especially pleased to be able to sing at St Giles which is the home church of our Musical Director, Jason Lambert. All warmed up and ready to go! 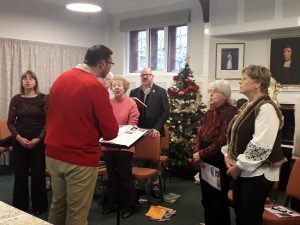 The Norwich Singers were very busy in the run-up to Christmas 2018, with two very successful carol concerts, as well as singing at a number of venues throughout the local community. 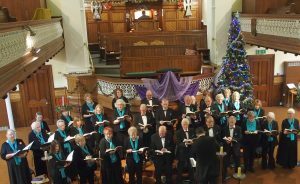 Our annual Christmas concert, on Saturday 15 December 2018 in Chapel Field Road Methodist Church was another successful Christmas concert for the choir. The evening told the Christmas story through carols, songs and poetry. 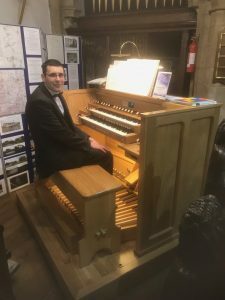 As well as many of the well-known favourite carols, the choir performed some more modern carols that are already featuring regularly in the Christmas repertoire, such as William Mathias’s ‘A Babe is Born’ and John Rutter’s ‘All Bells in Paradise’. 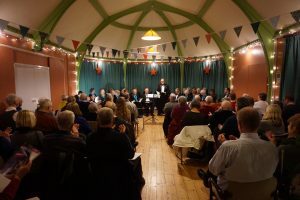 Three days later on Tuesday 18 December the Norwich Singers were very pleased to perform our Christmas concert again at How Hill as we have done in previous years. This is always a most enjoyable evening and the room was once again full to capacity, helping to raise valuable funds for the How Hill Trust. 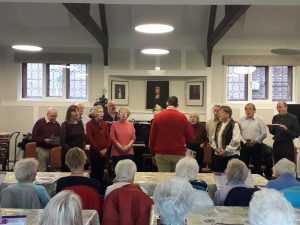 In the run-up to Christmas, the Norwich Singers sang at a number of venues throughout the local community. Our first stop on Saturday 8 December 2018 was Doughty’s in Norwich, which provides self-contained accommodation for older people. 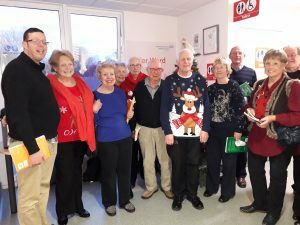 A small group from the choir spent a very enjoyable afternoon entertaining the residents with a selection of Christmas carols and songs. Sing, choirs of angels …. 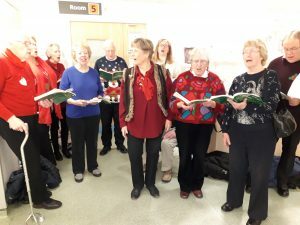 Next stop for Norwich Singers was Norwich Community Hospital on Thursday 13 December. 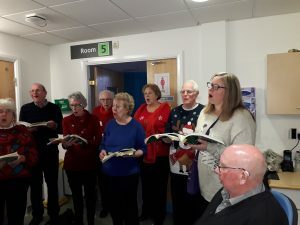 Some of the choir entertained patients with festive carols and songs – and some fine Christmas jumpers! 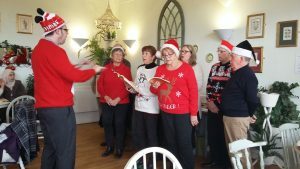 Finally, on Friday 21 December, a small group from the choir sang carols at lunchtime at Café Britannia in Waterloo Park. Norwich Singers © 2019 All Rights Reserved.